After a few weeks of slow painting (having a cold and busy working days + the union strikes) I finally finished my Cetratii. This being the 3rd unit of medium based models who look pretty much the same, also made it less fun to paint. All I still need to finish now for my pXerxis list are 1 unit of Arcuarii and 1 unit of Incendiarii. I will only be painting up 4 of each as the odds of playing 2 full units of each are rather small and for those rare cases I won’t mind setting up 2 non painted models at all. However first I need to concentrate on finishing models I currently proxy. This means I reallt need to get my Keltari unit, maximus and my 2 void spirits done. And all of this by the 4th of January. 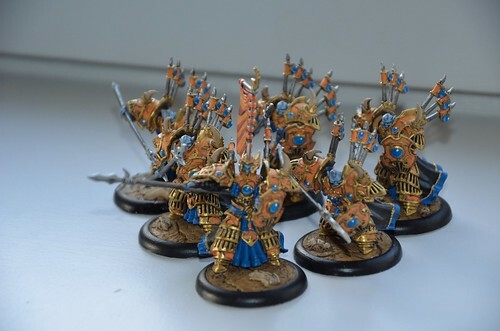 Since the Keltari have far less gold on their armor compared to the med based units, they should be painted up rather fast. Same goes for the void spirits as I will be painting their body in the same sand color as the bases and dry-brusing the highlights. Since the 2015 Steam Roller beta seems pretty final at this point, I have made a new pXerxis Fist of Halaak list. I removed a min unit of arcuarii from the list, changed the full unit of beast handlers by 2 min units and added the Flayer cannon crew twice. Tier 3, so some added bonus compared to tier2, and directly applicable to the units I swapped in. The reasons for this change are to be found within SR2015, and since it’s still at the Beta stage right now, I won’t comment further on that specific reason and use an SR2014 element to explain. In the SR2014 Scenario Fire Support, the objectives have an ability called Firepower. Firepower: While this objective is not contested by an enemy model, the ranged weapons of friendly models with light artillery within 4″ of this model gain boosted damage rolls. In short Skorne venator flayer guns have strafe D3 and gain +1 damage vs medium bases and +2 against Large bases. add an additional die to those damage rolls and that’s some potential right there. This brings us to a nice 5 damage on average against a heavy. And the potential to have 6 shots total per turn. And 30 damage is nothing to sneeze at. This concludes that math and theorymachining part, and I wanted to get some play experiences on this new setup. Or that was the plan, before it horribly failed. Which also brings us to the sleeping part. As I had a terrible week, having a cold and not that much sleep, my play was pretty terrible for both games I played and the artillery pieces themselves were destroyed on my opponents turn 1 (sad panda all over the place indeed). The main error is that even if something has advanced deployment, it doesn’t mean it should be advance deployed and even if it is, it doesn’t have to be all the way out there either. Doing so get the artillery removed before it could ever matter. As it will be used for assistance in zone clearing, it only needs to be in place bottom of turn 3 and this means there’s no need to have it advanced deployed to begin with. You also want both pieces within 4″ of the objective so their location is pretty much fixed. The boosted rolls are what makes the artillery piece worth bringing, so not benefiting would make the list change useless. My Mordrikaar list was designed to be a Cryx drop (pretty much copied the list Martin H. used with minor tweaks), but this meant it was to narrow as Cryx for some reason is getting less representation in events this year. I had several events where I just didn’t find a good round to drop my Mordrikaar list and with d&c that’s not a good thing at all. The main issue against factions like Khador was the lack of ranged defense when moving up for the Nihilators. Also the Cetrati were slow and the bloodrunners often tricky to utilize in a positive manner. The new releases such as the Keltari and Maximus got me into some list building along with others in my local meta. Also as the caster is Mordrikaar and Hollow is a nice spell, both 10 man units will be tough. So far I have only gotten 1 game in with this list, but the result vs Khador in that match was much better compared to the original list. In short very promising, more to follow on this one later. That’s it for now, painting on the Cetrati is advancing slowly (having a cold is not productive at all), hopefully I can get them done this week.